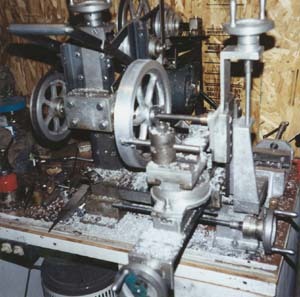 Over the years Marvin Guthrie has built several of the Gingery projects including the milling machine and the metal lathe. 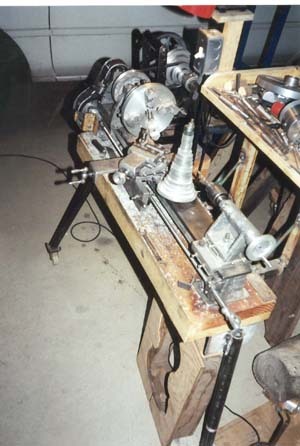 Recently he was building one of the Atkinson engines, but his lathe did not have enough swing to turn the 9" flywheel casting. 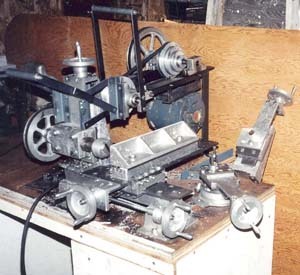 His solution; turn the flywheel on his home built milling machine. Excellent idea and the photo below shows the set up. Many thanks to Marvin for sharing pictures of his great looking machines, and for sharing the flywheel set up with us. November 16, 2006 update. Marvin has posted additional pictures of his projects on his web page. You can see those pictures at the following link. . .